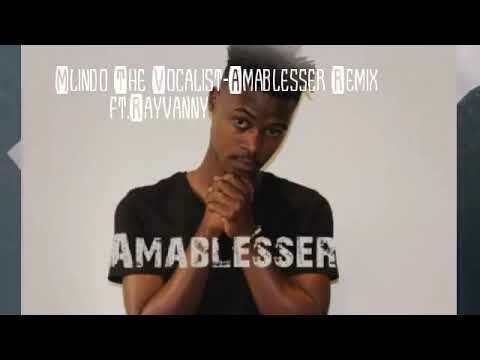 One of the songs off Mlindo The Vocalist‘s newly released album, “Emakhaya” is the remix of “Amablesser” on which he featured Rayvanny. The original song – which by the way is also on the album – had him collaborating with DJ Maphorisa but he chose to go with Rayvanny on the remix and it worked just fine. Earlier this month, Mlindo The Vocalist had teamed up with Sfeesoh, Kwesta and Thabsie on “Macala”, one of the songs off the album. “Amablesser”, the first joint effort of DJ Maphorisa and Mlindo The Vocalist is the third track on the album as well as this newly released remix done with Rayvanny. “Amablesser” remix joins Other songs on the album like: “Ancestors”, “Emakhaya”, “Egoli”, “Usbahle”, “Cold Summer”, “Imoto”, “Usukulude”, “Macala”, “Lengomao and further increases the cred of the talented artiste. Collaborator, Rayvanny broke into the music scene by competing and winning a rap freestyle competition. In 2012, he joined a music group called Tip Top Connection where he got more experience in his music career and connected with a lot of artists. Rayvanny is well known for several hit songs including “Kwetu” and has collaborated with numerous notable artistes including Diamond Platnumz, Rich Mavoko, Harmonize, Jason Derulo, DJ Bucks, Jah Prayza, Korede Bello, and DJ Maphorisa. Rayvanny kicked off the year with a feature on Fid Q‘s remix of “Fresh” before dropping “Pochi Nene” in April alongside S2Kizzy. He did a remix of “Pochi Nene” in May, recruiting Khaligraph Jones, Godzilla, Rosa Ree, Izzo Bizness, Country Boy, and Young Dee on it. “Chombo”, “Sikupendi”, “Wasiwasi”, are some of the songs that have come from Rayvanny in the last two months, not forgetting that feature on Nsoki‘s “African Sunrise in June. This feature continues that amazing tradition of churning out and being a part of good music. You should listen right away. To listen, stream or download here and share your comments in the comments section.